Now that Nightcrawler is out on disc, I finally got to check out the Jake Gyllenhaal-starring thriller that’s part serious and part satire. The film is written and directed by Dan Gilroy, brother of Tony (director of Michael Clayton). Dan has written quite a few films over the years, including Freejack, Real Steel and The Bourne Legacy, but Nightcrawler is his directorial debut. And a pretty darn confident one at that. Gyllenhaal plays Lou Bloom, and opportunistic yet enterprising young man who stumbles upon the lucrative trade of ‘nightcrawling’. This means he lurks around the streets of Los Angeles in the dead of night, glued to his police scanner. The moment a crime gets reported, he’s there with a video camera, getting some gruesome footage for the morning news. After his initial attempts lead to success, Lou sets out to raise the stakes, pushing himself further and further in an attempt to get that ‘perfect’ piece of footage. I have no idea just how close to reality Nightcrawler veers, but with a bit of a mental squint, the world it describes doesn’t seem that different to our own. It’s been a long time since I’ve watched live television, but the stories peddled by commercial news networks aren’t that far removed from what we see in the film. It’s all about constructing a narrative, and if that occasionally requires manipulating events, then so be it. It’s all in the name of entertainment, right? Lou is a mesmerising character. He’s creepy, borderline sociopathic in his detachment, yet there’s something charismatic about him too. I wasn’t repulsed; I wanted to see what he’d do next. Rene Russo’s TV news director, Nina Romina, is equally interesting. She and Lou take turns pushing the envelope, and together they create something horrid. You know when you’re out in the small hours of the morning, it’s dead quiet and your normal suburban streets seem like an alien world? That’s the kind of world Nightcrawler explores. It’s a fascinating look at the familiar turned mysterious and the mundane turned horrifying (and I’m sure it made it shooting the film cheaper too). The cinematography is crisp and clean, and all the night time driving scenes in Lou’s sports car put me in mind of Drive, which featured a similarly detached leading man. The disc has a smattering of interviews and featurettes. They’re tightly edited, so no one waffles on, however the interviewer is off mic the entire time, which is frustrating. If there would be any complaint about Nightcrawler, it would be that nothing ever phases Lou. The same thing frustrated me a lot more in Thank You For Smoking – a forever dauntless protagonist is less interesting than one who questions himself. The last ten minutes didn’t feel quite right either, suggesting perhaps some reshoots or last minute alterations to the script. 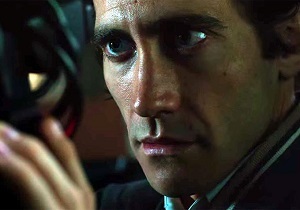 That being said, Nightcrawler is every bit as good as audiences said back when it was on the big screen. A fascinating tale of obsession, it’s a film that really gets under your skin. Nightcrawler is available now on Blu-ray and DVD from Madman. This entry was posted in Film Reviews and tagged Noir, Satire, Thriller by Stuart Wilson. Bookmark the permalink.